In the first of my series on Peacemakers, I have chosen to examine the life of Martin Luther King Jr. and the impact that he had on equal rights in the United States. Born the son of a Black Baptist minister, Martin Luther King, Jr. (1929-1968) believed, like Mohandas “Mahatma” Gandhi, that the power of love was greater than the power of hate. His beliefs led to his own non-violent crusade against racial segregation in America. Read on for inspiring information, as well as a class discussion topic and classroom activity idea. Growing up in Atlanta, Georgia during the 1930’s and 1940’s, King lived in a segregated society that believed that blacks were inferior to whites. While attending Morehouse College, an all male black college, in Atlanta, Georgia, King heard Rev. Benjamin Mays speak on the idea that the black churches should be the ones to lead a movement of social change and end discrimination. He also attended a lecture about the life of Ghandi and was impressed by Gandhi’s philosophy of satyagraha, a philosophy and practice or non-violent resistance. In 1954, the U.S. Supreme Court declared, in what would be the monumental Brown v. Board of Education ruling, that segregation in public schools was unconstitutional. Soon after, King became the pastor of the Dexter Avenue Baptist Church. 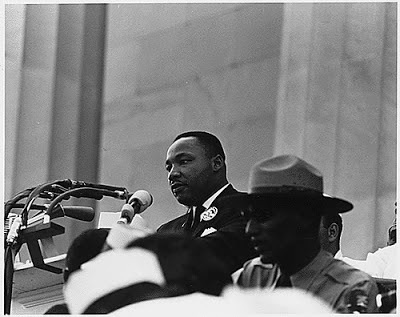 Here, King urged his congregation to actively opposed segregation. He led a boycott, crippling, Montgomery’s public transportation system. In 1956, the U.S. Supreme Court ruled that Alabama’s state and local laws requiring segregation on public transportation was unconstitutional. King became a leading spokesman for civil rights in the United States. While his work was peaceful, King was arrested and his life threatened on several occasions. In April 1963, he was jailed after a demonstration. His “Letters from a Birmingham Jail” argued that everyone has “a moral responsibility to disobey unjust laws”. After many years of effort, President Lyndon B. Johnson signed the Civil Rights Act, making segregation a federal crime in July of 1964. At the age of thirty-five, King was the youngest man to be awarded the Nobel Peace Prize. Although Martin Luther King Jr. was a leader in promoting peace and equality, sadly, King was assassinated in 1968. In 1983, Congress set side the third Monday in January as Martin Luther King Day. King’s story of having a dream and working together peacefully to find a solution is one we can share in every Montessori classroom. Children of all ages can discuss the inequality of segregation and empathize with those who suffer because of it. They can discuss unjust laws and see that through peace and love, even the unjust can be made just. Below is a discussion topic and class activity that can be used in your Montessori classroom. Discussion Topic: Dr. King said “The only force capable of transforming an enemy into a friend is love.” Do you believe that? Why? 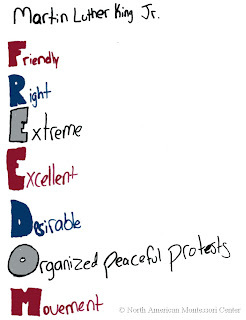 Class Activity: Write an acrostic poem using the words FREEDOM or EQUALITY. Start each line with the first letter of each word. NAMC’s Five Great Lessons / Cosmic Education & Peace manual sets the stage to develop more caring and peaceful citizens. © North American Montessori Center - originally posted in its entirety at Montessori Teacher Training on Thursday, January 17, 2008. I have been trying to identify online montessori training. Do you know if such an animal exist?